Vermilion Energy (NYSE:VET) offers investors a robust 8.8% yield today. That's huge when you consider that U.S. oil and gas driller ConocoPhillips yield less than 2%. If you want to own an oil driller and generate income, Canadian-based Vermilion Energy may have popped up on your radar. But be careful what you wish for, there's a risk that the payout won't last, particularly now that oil prices are falling anew. Vermilion is a Canadian energy company with shares listed on the New York Stock Exchange. It 's focused on exploration and doesn't own downstream assets (such as refining and chemical plants). It has operations in North America (expected to provide 62% of 2019 production), Europe (33%), and Australia (5%). It became public in 1994 in Canada as a regular company and then switched to a Canadian Royalty Trust in 2003 because of the tax advantages of that structure. When the Canadian government removed those advantages, it converted back into a regular corporation in 2010. It listed in the U.S. market in 2013. Vermilion pays a monthly dividend, which is nice if you're looking to replace a paycheck in retirement. It hasn't increased its dividend every year, but the conversion from a Royalty Trust to a regular corporation was enacted without a dividend cut (many other Royalty Trusts cut their payout upon converting). That said, the dividend has trended higher over time. For example, the dividend was 0.17 Canadian dollars per share per month in 2003 and is CA$0.23 ($0.17) today. The dividend was most recently hiked in April 2018. Can it cover the dividend? That, however, is all the past. The future is what matters. On that score, production trends are fairly positive. Production was increasing at around 6% a year between 2003 and 2012. The growth rate has more than doubled to 15% on average since then. The company is currently looking for 18% production growth in 2019, with a capital budget of CA$530 million. After 2019, the company expects its current lineup of assets to provide 5% annualized production growth through 2023. In other words, management is confident that it can keep growing its business. Those top line production growth numbers are great, but the picture doesn't look nearly as nice when you look at production on a per share basis. Production growth per share is slated to increase just 8% in 2019. This is a key issue to consider because one of the ways this relatively small driller raises cash is by selling shares. The share count, for reference, has increased around 23% this year. This is an important factor for investors to monitor, especially in light of the current downturn in oil prices. For example, when the company announced its 2019 investment plans in October, oil prices were higher than they are today. At that point, the company expected dividends and capital spending to eat up only 82% of funds from operations. After a roughly 20% decline in oil prices, the company updated that figure to nearly 100% at its annual investor day event, about one month later. Falling oil prices were the big reason for the change, and a continued decline could increase the likelihood of additional stock sales to make up for cash flow falling short of expectations. That would, in turn, dilute current shareholders even though it would keep the investment plan on track. VET Financial Debt to Equity (Quarterly) data by YCharts. The balance sheet won't be much help on that score. Financial debt to equity is a little under 30% today. While that's not an unreasonable amount of leverage, it does limit Vermilion's flexibility to use its balance sheet to fund growth spending. In fact, the driller is hoping to reduce debt over time, not increase it. 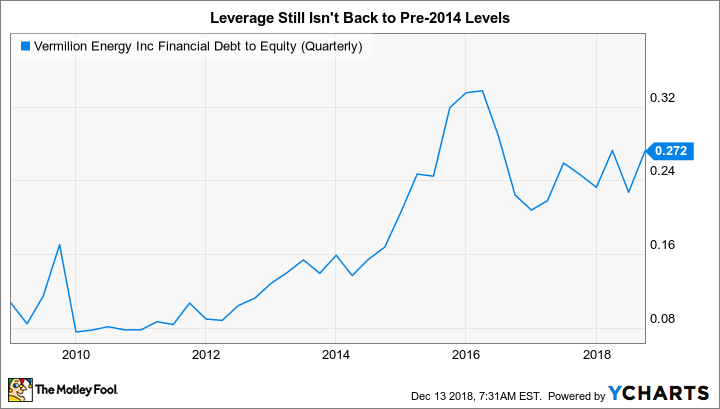 It used leverage to get through the last downturn and hasn't yet gotten its balance sheet back to pre-2014 leverage levels. In other words, a debt sale would be low on the list of funding options, though it's not out of the question. Still, effectively, cash from operations and, perhaps, stock sales will likely be the main supports for capital spending. None of this makes the dividend look quite as secure as it did before the recent oil price decline. Note that selling more shares would increase the amount of money needed to support the dividend. 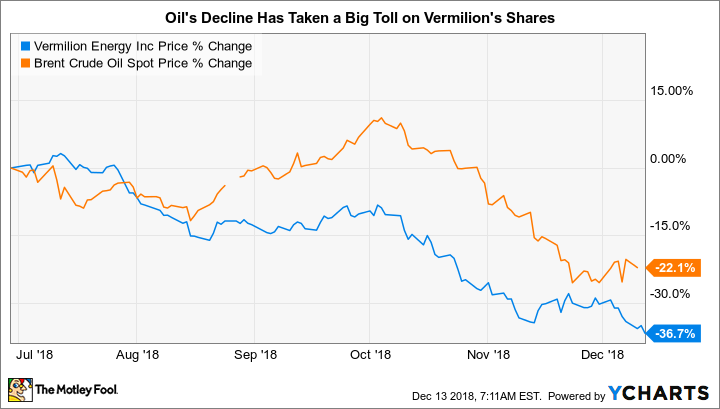 There's a good reason that investors have pushed Vermilion shares down 37% since July, increasing the yield from around 5.5% to the current 8.8% level. Oil prices, for reference, fell around 22% over that span. There is another option as well: Vermilion could postpone some of its drilling program in an effort to reduce spending. That would slow production growth, but preserve cash that could be used to support the dividend. Since it managed through the deep oil downturn that started in mid-2014 without cutting its dividend, that seems a more likely outcome than a dividend cut. However, at the end of the day, there is clearly a dividend risk here. All told, Vermilion's yield is very enticing. Conservative investors, however, would probably be better off waiting on the sidelines. There is a real risk that the dividend could end up being cut if oil prices remain weak. Although the driller's history of supporting its dividend through tough times might entice more aggressive investors, you should make sure you understand the risk-reward trade-off you're making before you buy in... and keep a close eye on what management does to get through the current rough patch.